Description: Sexes similar. 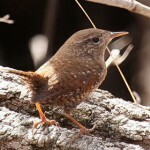 Dark brown above, with a solid brown crown and a black triangle on upper back that is streaked with white; bold white eyeline; and underparts that are mostly whitish, may have buffy belly and undertail coverts. 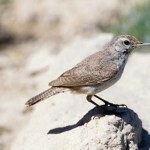 Behavior: Sings day and night during the breeding season. Habitat: Primarily found in freshwater marshes with extensive tall emergent vegetation such as bulrushes and cattails. Will also nest along banks of slowly flowing brackish tidal marshes. Where in Nebraska: Common spring and fall migrant across the state, and locally common summer resident north of the Platte River. 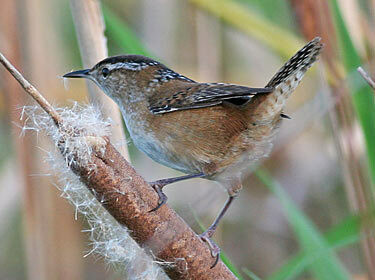 Additional Information: Formerly known as the Long-billed Marsh Wren.